FILE - Protesters are beaten with wooden clubs inside the back of a police pickup truck after being arrested outside the Parliament building in Nairobi, Kenya, in December 2014. Police and security forces are responsible for nearly 300 gun-related killings and dozens more injuries in the past two years, including cases of summary execution and stray bullets striking bystanders, a Kenyan rights group says. Jeremy Mutiso, 28, was chatting with friends near his home in Mathare one Sunday evening in June 2011 when a demonstration started. Police arrived to break it up. One hand was in his back pocket, he said, and he was unable to pull it out. People running behind him told him that he had been shot and was bleeding. Mutiso said it took hours to get to the hospital, where he stayed for two weeks. While in the hospital, Mutiso had asked if his father had followed up the case. He had not. "He can't do that,” Mutiso recalled learning. “He was afraid he will not be able to win the case. … he is afraid the cops might fight back in terms of harassing us." Mutiso later moved to a neighborhood he felt was safer. 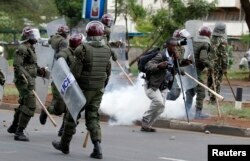 FILE - Kenyan police disperse a rally by university students in May 2014 in Nairobi. Kenya's Independent Medico-Legal Unit (IMLU) says security forces were behind at least two-thirds of gun-related deaths in Kenya between 2009 and 2013, and the trend has continued. The IMLU, which specializes in cases of torture and abuse by the state, says it recorded 199 killings by police in 2014, and dozens more injuries. As of October, the IMLU has recorded 97 killings in 2015. The vast majority of victims since 2009 were shot in the back or in the head, according to the group. That statistic, IMLU says, points to execution-style killings or situations in which security forces' lives were not under direct threat when they fired. Peter Kiama, the head of IMLU, says many cases go unreported and, for the few victims who do speak out, justice is rare. "In 99 percent of the cases we've handled in the last five years of people who have died of police bullets, whether they are suspects or victims of stray police bullets, the police have denied being involved,” Kiama said. “And, therefore, it has taken the family to follow up with the government. In the majority of the cases, the families just resign (themselves) to fate." 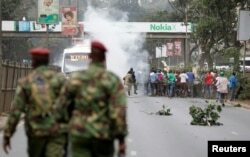 FILE - Supporters of Kenya's opposition Coalition for Reforms and Democracy (CORD) run after riot police fired tear gas before their "Saba Saba Day" rally in July 2014 in Nairobi. Police spokesman Charles Owino says that while people may get shot during operations, the number is exaggerated and police are not always to blame. "We must justify why we have shot at the criminal,” he said, “but the criminal is not accountable to any action they take. So, for that reason, we have incidents where people have lost their lives through stray bullets. But it's not that large number, like 200 annually as put by IMLU." The Independent Policing Oversight Authority, a government agency created in 2012, also has raised concerns about police shootings. In one recently concluded investigation, the agency recommended murder charges against a police constable in the November 2014 shooting deaths of two university students.